You may not be surprised to learn that Beverley Big Pants and I have had a number of dating disasters which I was reminded of whilst reading one of Leo’s posts over at Doggy’s Style. She’s had more than me on account of me wasting several years with Serial Shagger although we did have a break Rachel & Ross “friends” style once or twice. After a handful of dates with the wrong men, my sister thought she’d hit the jackpot when she was asked out to dinner a couple of times by a very handsome naval officer. He wined and dined her in some expensive restaurant before suggesting that they end the evening with a nightcap back at his place. As he had behaved like an impeccable gentleman on previous occasions she had no reason to suspect ulterior motives. He lived in a penthouse apartment overlooking Plymouth Sound and she was impressed by his luxurious home. A couple of brandies later and he remarked how well they seemed to get on and that he felt comfortable confiding in her. Suggesting that she wait in the living room, he said that he had something he wished to share with her. My sister wasn’t quite sure what to expect and braced herself with another brandy whilst thoughts of a bunny boiler ex-wife, a red room of pain or an exotic reptile collection all crossed her mind. Calling from the bedroom he asked her if she was ready and then casually walked out of the bedroom dressed as a Star Trek Klingon fully masked. Initially, she was relieved that she wasn’t going to have to feign interest in an arachnid or lizard collection but found it difficult to contemplate further dates with someone who wanted to spend every waking hour when he wasn’t working dressed as an alien, even though she had always wanted to spend her life with a man in uniform. 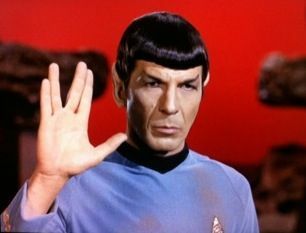 Giving him the Vulcan salute, she suggested that he go forth and prosper, made her excuses and left. And the moral of this story is to be careful what you wish for! Please bear with me I’m recovering from the Norovirus but promise I will get around to catching up with you all as soon as I’m back to normal full health! Fun post :-). (I had to google norovirus and wish you a speedy recovery). A man with an identity crisis? Yeah, no thanks. 😉 … Thanks for the smile … Wishing you a full recovery. I’m glad you are up and about. LOL stuck in the lift with the aliens? too funny! I’ve turned a corner today but I can’t believe how ill I felt but I am now back with a vengeance! That would have been my sister’s ideal date, she loves klingons! Indeed there are quite a few which are less than attractive! Very entertaining! So sorry to hear you have been sick! I have a cold, as well. Hopefully, tomorrow is a better day. That’s really funny. I was nervous reading this when it got to the part where he left the room. I was afraid it was going to be something incredibly frightening. I think in some ways my sister was glad it wasn’t something worse either way he was history once he said he needed to confide in her! Having been married to a “man in uniform” (Navy), I can say in all honesty, it’s not that great. But a Klingon—haha, that’s at least different. I expect he would have wanted her to convert to Klingon, too. Hope you’re feeling better soon. Oh! please recover totally and soon! You’ve been missed, my dear. What a bunch of weird ones out there for sure. As my Dad says in true Yorkshire fashion “there’s none so queer as folk”. I hope that you’re feeling a better by now … I can see my booty is in good company with yours *smile – terrible thing – Norovirus. Never had it, but have friends that have been suffering from it. Dallas, great news – you take it easy now under the weekend. Lyrca is some terrible material – both to look at and to feel. Haaaaa!! Oh man. I think she handled that VERY well! I would’ve sputtered my way through the rest of the evening trying to plot an escape plan that I would never think of in time because I have a guy dressed as a vulcan sitting next to me. HA! I wish I could have seen the look on your sister’s face when he appeared from the bedroom. And I was also relieved it wasn’t something worse! My dating disasters have happened before I even went out with them. I recently received a naked picture of a guy I was going to get happy hour drinks with (of course I said wrong tactic for this girl) and then I just got asked out on a first date to a Subway deli for lunch. I’m beating the good ones off with a stick over here! As someone who works with very geeky people (my company publishes comics!) who is used to hearing very geeky conversations all day, I don’t judge Trekkies (in case you were unaware of the name fans of Star Trek go by) for their devotion. I have my own weird obsessions I won’t divulge here. But cosplay (I cannot believe I just used that word, working at this company is doing wonders for my geek vocabulary) has always kind of freaked me out. I used to cry whenever I saw someone dressed as Santa Claus/clown/etc so seeing someone dressed as a freaky fictional creature would not help things. Did this man always dress up when lady friends came over? There are so many worse things, so many. I would only say, if that was the only secret in the closet she should have shouted “beam me up” and seen where it got her. So glad you are feeling better, that virus is hard to shake. My dating disasters are quite mild in comparison to my sisters! Nought so strange as folk….. Hope you’re feeling better soon. Great story! I am glad you are beginning to feel better. I am catching up on your posts. We have been on the move now for over a month and finally got internet in our new home in Morocco. Men in uniforms! 🙂 He sounds like a real crackpot. I would also have hightailed it out of there. What a laugh! For some reason we attract a lot of weirdos or as my Grandma would have said “Jesus’s little sunbeams”. It’s a family thing!